Approximately 20 years ago, Mineral Springs resident Holly Prouty, a long-time RN and Lactation Consultant (IBCLC), was in the thick of trying to help alleviate her husband’s ongoing and severe brain-related medical problems. Despite trying numerous modalities, they could not find him relief from pain. After four major surgeries and advice to do more invasive treatments, she felt, on his behalf, that they had done enough. A suggestion to try a “cranial-something” practitioner down the hall from her neurologist led both Proutys’ lives in a different direction. A respected nurse, speaker, and consultant, Holly had no intention of changing what had become a successful, wide-reaching career. However, she could not disregard the nearly instant and sustainable long-term relief that craniosacral work had given her husband. She took on the task of becoming his primary therapist by studying and becoming certified as a craniosacral therapist (CST), which then infused itself into her other specialties. “I was well grounded, and people knew me in my work,” she said. “…..When I said I was doing this, they were intrigued. Everything I’d done (before this) culminated in this work…a new profession. I just really felt like divine intervention had a plan for me.” She began working on clients and performing this technique on the many babies in her care. As the intensity of work and her passions continued to merge, it was during a solo drive down the road, that she distinctly heard a voice say, ‘You are going to be a craniosacral therapist.’ She pulled off the road and proceeded to have a singular debate. At that moment, on that day, she said, “ok” – and her life changed forever. 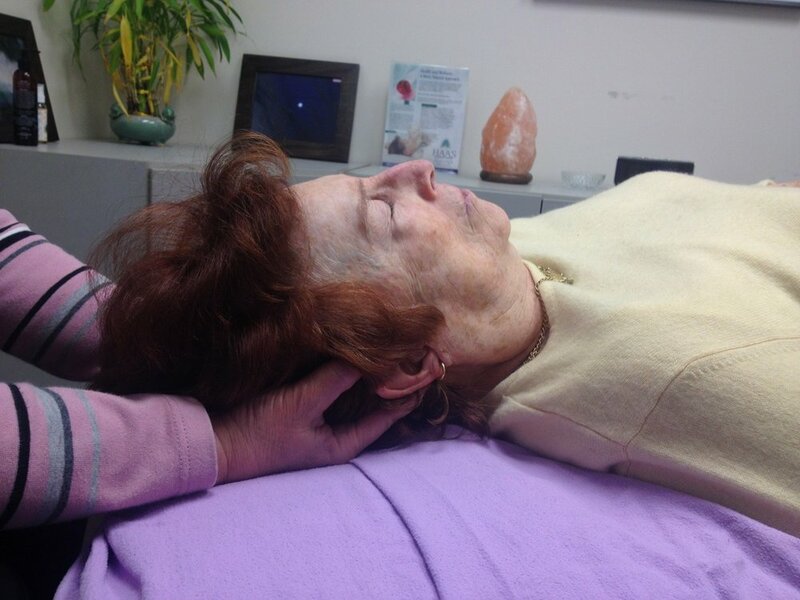 CranioSacral Therapy, developed by Dr. John E. Upledger, is a bodywork approach using a light touch to release tension, relieve pain, and improve whole body health. Upledger, an osteopathic physician and professor of biomechanics at Michigan State University, led a team of various scientists from 1975-83 to create the basis for CST. The session takes place in a quiet setting; the patient remains fully clothed as the therapist touches parts of the body to monitor the rhythm of the fluid that flows around an individual’s nervous system. The therapist then uses delicate, manual techniques to release restrictions in problem areas and relieve tension on the brain and spinal cord. Some of the conditions believed to be helped or cured by CST include newborn feeding issues, reflux, ear infections, fibromyalgia, headaches, neck aches, temporomandibular joint pain (TMJ), stress, and pain. Now, she gets client referrals from Western practitioners (neurologists, dentists, psychologists, specialists, pediatricians, chiropractors, etc.) and even sees the practitioners herself, working trauma through the tissues with a light touch. She has seen nearly miraculous results. “I have had sessions where I knelt down in thanks-giving for having learned a modality that has such an effect in changing people’s lives,” she said. Humble in approach, Holly firmly detracts from any praise given to her workings and eschews being known as a healer, by repeatedly stating that it is the patients who heal themselves. “You can’t heal if your mind, body, and spirit aren’t together – healing is (done by) all three of those. They are very important and integral to the process,” said Holly. Holly Prouty RN IBCLC CST, 1312 Matthews Mint Hill Rd, Matthews, website.